So much cheese. So many colors. Remember the “YOU. SHALL. NOT. PASS!” scene in The Fellowship of the Ring? The one where Gandalf the Grey goes super Christ figure-y in the Mines of Moria and takes out the Balrog, thus sacrificing his own life for the greater good? (Even though, like, how big of a sacrifice was it really if he knew he was just going to come back as Gandalf the White)? Now, imagine instead of Gandalf, it’s an anthropomorphized Los Angeles, and instead of a super cool whip-brandishing fire demon, it’s a grotesque amalgamation of bread, dairy, and food dye that crawls its way across the internet, leaving nothing but Instagram likes and neon-hued cheese slime in its wake. Thanks to Chomp Eatery in Santa Monica, L.A. now has its very own rainbow grilled cheese—and it needs to be banished back to Hell. We almost did it, L.A.! We almost managed to completely bypass the biggest foodie-fueled travesty since the red velvet apocalypse of ’05 (thanks for that one, Sprinkles). And then we had to go and jinx it by being all self-congratulatory on the blog last week, acting like we had the moral high ground over other cities for only breaking out our rainbow food swag during Pride celebrations. Not only are we no better than New York with their rainbow bagels, or Las Vegas with their rainbow lattes, but we couldn’t even invent our own city-specific rainbow food; we just copied an idea from Hong Kong. Couldn’t we at least get a rainbow quesadilla or something? It’s not that I’m against having fun with food, and this isn’t some anti-Millennial hit piece about dependence on social media, even though you could argue that the movement does seem largely Instagram-driven. The whole rainbow food thing is just gross. Look at it, it’s like someone threw up a box of crayons and tried to mop it up with a loaf of bread. We’ve so thoroughly reversed the process of evolution that bright unnatural colors no longer represent poison, they represent the want to collectively stuff our faces with novelty foods. 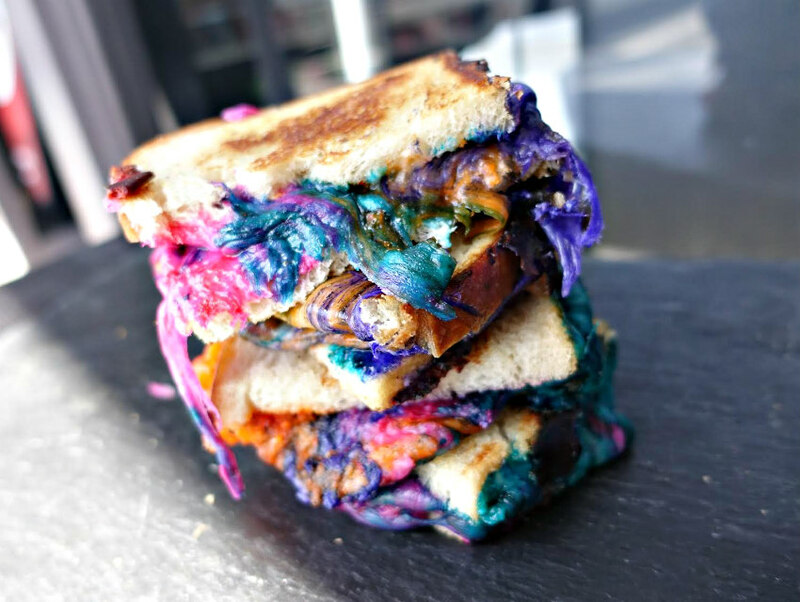 The Unicorn Melt is now available for purchase at Chomp Eatery in Santa Monica for $6.